Landscape. The East Hertfordshire landscape is beset by pylons and overhead cables. 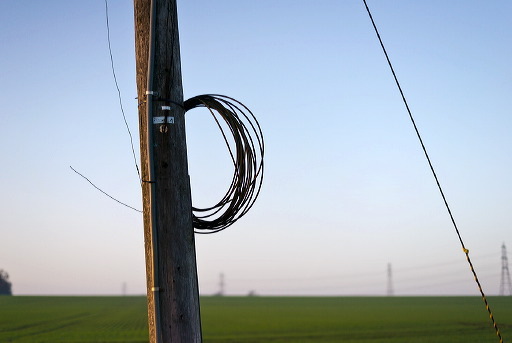 I was attracted by the contrast here of the sharp coil of cable on the telegraph pole against the hint of a soft landscape (complete with pylons) under a clear blue sky in the background. I guess I was trying to make a small comment about technology upsetting our view of the countryside, but in competition the judge didn't see the point of the image at all. It's not often that I walk around with a 'standard lens' on the camera, but I really like the diminutive (by modern standards), sharp and almost distortion-free AF Nikkor 50mm f/1.8D.